As I enter the boutique I see a sleek sit-on toy car with a huge key sticking out of the boot, probably to wind up the mechanism. On the left is a cool-looking motorbike, which is actually much too clean and shiny to be a motorbike. The name on the tank reads Chicara Nagata. I look around and all I see are fantastical mechanics: a walking lamp, resembling some kind of science-fiction creature; not far from it is something that looks like the C-3PO robot from Star Wars, as if I had been transported into the future, but then a strange future imagined by George Lucas. All of a sudden I see it. “There it is!” I think to myself. “The MoonMachine.” I walk towards a table displaying an awesome-looking watch. 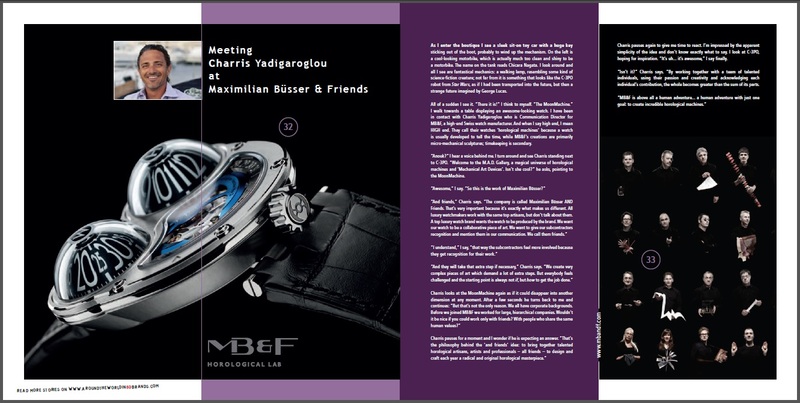 I have been in contact with Charris Yadigaroglou who is Communication Director for MB&F, a high-end Swiss watch manufacturer. And when I say high end, I mean HIGH end. They call their watches ‘horological machines’ because a watch is usually developed to tell the time, while MB&F’s creations are primarily micro-mechanical sculptures; timekeeping is secondary. “Anouk?” I hear a voice behind me. I turn around and see Charris standing next to C-3PO. “Welcome to the M.A.D. Gallery, a magical universe of horological machines and ‘Mechanical Art Devices’. Isn’t she cool?” he asks, pointing to the MoonMachine. Charris pauses again to give me time to react. I’m impressed by the apparent simplicity of the idea and don’t know exactly what to say. I look at C-3PO, hoping for inspiration. “It’s uh… it’s awesome,” I say finally. “Isn’t it?” Charris says. “By working together with a team of talented individuals, using their passion and creativity and acknowledging each individual’s contribution, the whole becomes greater than the sum of its parts.